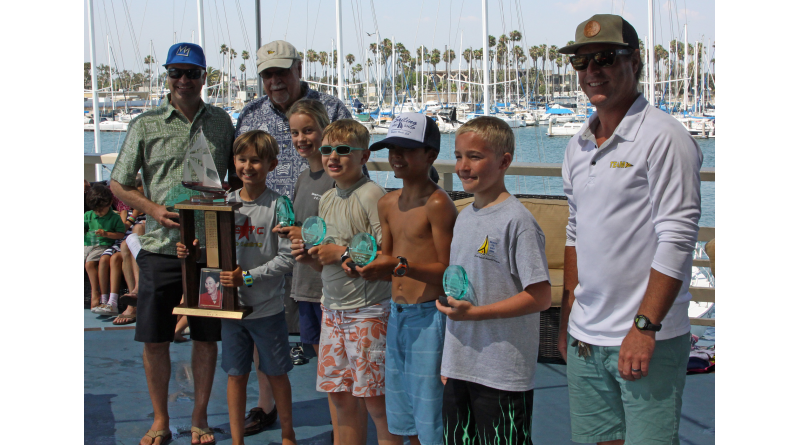 Pictured left to right: Alex Uniack, son of Jessica Uniack; 2016 Jessica Uniack Memorial Beach to Bay perpetual trophy winner, Alex Lech of Long Beach Yacht Club who finished in first place in the biggest class, the Sabot C3s; Bill Uniack, husband of the late Jessica Uniack; Paige O’Dell, Alamitos Bay Yacht Club, second place; Tanner Jolly, Alamitos Bay YC, third place; Hamilton Zahn, LBYC, fourth place; Isaac Sweeney, Seal Beach Yacht Club, fifth place and Long Beach YC Sailing Director Jess Gerry. LONG BEACH — Alex Lech, 10, of Long Beach Yacht Club won the 29th annual Jessica Uniack Memorial Beach to Bay Race perpetual trophy July 28 in racing his Naples Sabot dinghy to first place in the Sabot C3 class, the largest class for the event. The annual junior sailing race is hosted each year by Long Beach YC and, this year, was sponsored by Bellingham Marine and supported by Sailing Pro Shop and Ganahl Lumber. His dad and mom, Radek and Agnes Lech, were beaming and shared why his accomplishment meant so much to them. Long Beach YC Sailing Director Jess Gerry agreed and talked about Alex and his big improvement over the last year. Other first place finishers in their respective classes were Scott Pearl, Long Beach YC in the Sabot C2 class; Thomas Nilsen, Bahia Corinthian Yacht Club, Sabot C1 class; Axel Stordahl, Alamitos Bay Yacht Club, Sabot A class; Luke Worsham, Leeway Sailing Center of Long Beach, Sabot B class; Tate Christopher, Alamitos Bay YC, Optimist class; Matthew Petro and Cole McCarthy, Long Beach YC, Collegiate FJ class; Carsen Lenthall, Dana Point Yacht Club, Laser class; Hannah Carter, Dana Point YC, Laser Radial class; Ben Hagadorn, Huntington Harbour Yacht Club, Bic class and Garrett Schnack and Griffin Jeannette, Long Beach YC, RS Feva class. Most of these classes sail in bays and occasionally on the ocean, but this is the only junior sailing event of the year where the 8-foot-long Sabots ever venture out on the ocean. The event was postponed one week from its originally scheduled date of July 21 due to a major sewage spill in the Los Angeles River that closed all beaches in Long Beach and Seal Beach. Long Beach Yacht Club consulted local agencies and decided it was in the best interest of the young sailors to wait a week to run the race.